When I first heard that I was to accompany a violinist on a piano for a fund raiser concert, I was bemused. What fund raiser? Who’s the violinist? Does a concert mean, like, in front of a lot of people? What pieces do I have to play? Fortunately, I have a patient teacher and she explained the whole process to me. It didn’t make me feel any better though. My stomach churned as I imagined touching the wrong notes in front of a huge audience. But my parents and instructor assured me that what mattered to them was the practice, the diligence and the sincerity with which I carried out the task. Gradually as the days whooshed by, my head was a lot clearer. I was to play two pieces. In a few weeks, I had finished learning the pieces. What remained were the fine tuning and the practice sessions with the violinist. These proved to be much harder than learning the pieces. Painstakingly playing each section, over and over, to ensure that no mistakes would occur on stage was no small task although it was unlikely that my concert performance would be identical to what I practiced, the preparation played a vital role. What I would do on the piano on the day of the concert, no one could foresee. The concert was being held to raise funds for Parikrma Foundation, a charitable organization focused on education for underprivileged children. I felt happy and proud to be helping this cause. This spurred me on and made me all the more determined to do a good job. The day inched closer. The violinist with whom I would be playing visited me, to break the ice and practice together. She was a girl, younger than me, and fun loving. We had quite a few things in common. After a few practice sessions, we were raring to go. Two others and I were to be the accompanists for the fund raiser. My emotions on the D-day were no different from those on the first day. I was happy, jumpy, and slightly nervous. The concert started. I was the last accompanist, so I relaxed backstage on a couch and listened with my eyes closed. The music calmed me and let me accept the fact that whatever happened, I would give my best. What happened after that was not in my hands, or anyone else’s. When my turn came, I smiled brightly and took my seat on the piano. I started, and the rest of the music was a blur, but somehow I know I will never forget that blur. Apparently, it turned out quite well. I did make a few mistakes, but I did not let it worry me much. What had happened had happened, and I was quite glad at the way it had turned out. The concert taught me quite a lot, and not just in music. I learned to work harder than I ever had before, and I understood that mistakes can happen anywhere, and you should learn from them. I learned that there is no greater pleasure than doing something for other people, even more so if you know that it will help them. The funds raised at this concert were about one lakh rupees, and there was no one prouder than I when I was told the amount. The money was to help children in slums, and I was filled with gratitude to my teacher and my parents who helped me participate. Without them, I would probably still be at home, thinking, “Should I?” The concert was something of an eye opener; it brought into focus everything that I could do, and something that I was proud of. I think every young student should aspire to be part of an initiative like this for the bounties reaped are beyond the imagination of one who has not been fortunate enough to try it yet. The author is a student of National Public School, HSR Layout, Bengaluru. She has been learning the piano for the past five and a half years. 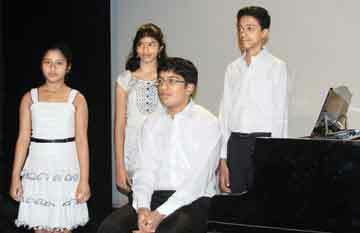 She has also been learning Carnatic vocal for more than six years. Her interests include reading, writing, math and all kinds of sports activities. She can be reached at raji.rama@hotmail.com.